To create the fun background, I stamped various sentiments from the Bionic Bots stamp set with Black Licorice hybrid ink. Then I colored the robot with Copic markers and I fixed him on vellum to the background. For more inspiration, you can also check my MFT Gallery on Pinterest! I also have a YOUTUBE channel with video tutorials! Great job coloring that robot! Looks 3d. That robot is soooo darn cute. Love this! So stinkin' CUTE Francine! Love it! Oh, Francine - YOU used the ROBOTS - so excited and look how cure he is - you have colored him as perfectly as you do everything!! Love the words in the background and all that yummy ripped vellum over that - what a super cool and ultra amazing card!!! Hope you are smiling and having a beautiful day!! I like the vellum behind the Bot. Thanks for a week-long job of making the Hop be so inspirational. beautiful card! so clean, so perfect! Wow!! 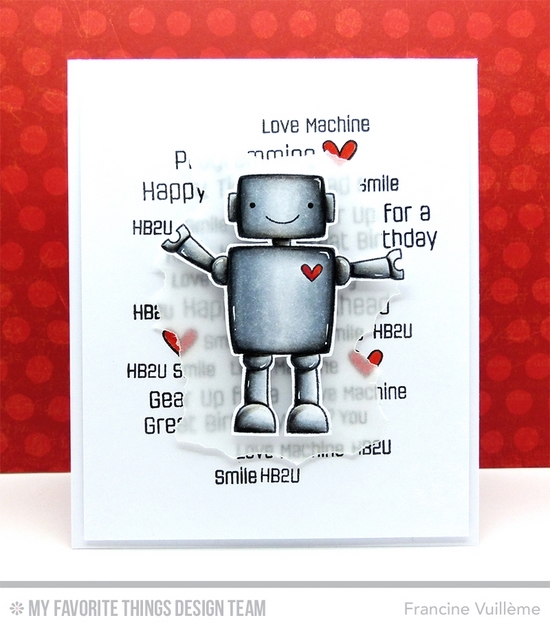 Love this cute bot card with the vellum touch! Your coloring is incredible! Thanks for sharing! Super cute... 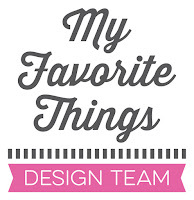 I LOVE the robot and LOVE that you were featured on Jennifer's BLOG today! CONGRATS!!!!!!!!! !